A long time ago, in our very own galaxy, a young actor named Mark Hamill donned the loose-fitting tunic of a Tatooine moisture farmer. He didn’t know it at the time, but Hamill was acting in what would become one of the most influential films in the history of cinema. Since Star Wars, Hamill has had a varied career, including a ton of voice acting. But to many fans, Hamill is best known for playing the role of Luke Skywalker, the hero of the Battle of Yavin. On Saturday morning, Hamill gave fans a twinge of nostalgia when he tweeted a photo of himself on set of the first Star Wars film. 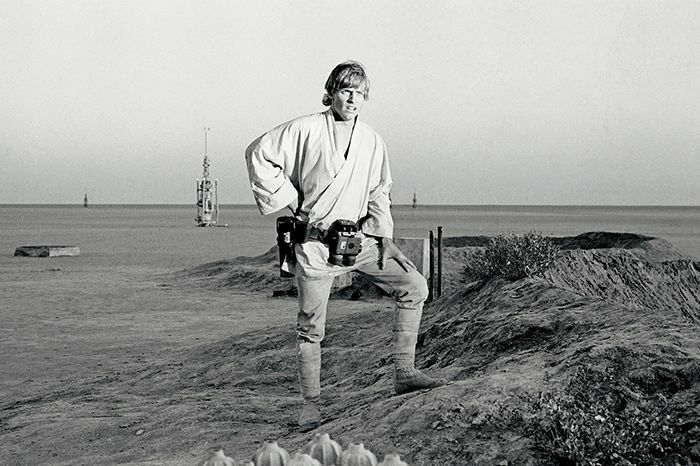 Under the Tunisian sun, Hamill squints into the camera of Continuity Supervisor Ann Skinner. “Perhaps the very 1st #LukePic,” says Hamill. Skinner took the photo right before the scene in which Luke emerges from the Lars home to check out the Jawas’s wares, including C-3PO, R2-D2, and the badly motivated R5-D4. In a response to a fan’s question about his state of mind on that first day of shooting, Hamill says that he was confident the film would be huge from the beginning. The crew, though, was less optimistic. This photo is part of a collection of Skinner’s work as continuity supervisor for the film, which includes other great behind-the-scenes photos like Greedo with his mask off, Darth Vader without his helmet, and the Native Tattooiners — also known as Sand People — leaning on their Gaffi sticks.